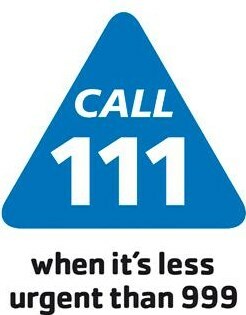 If you require urgent advice or attention outside normal surgery hours please call 111. The service covers the hours Monday to Friday 18:30 – 08:00 and all day Saturday, Sunday and Bank Holidays. Staffed by nurses and trained operators the 111 service will give you immediate information and friendly advice on what to do and what not to do any time of the night or day. And of course, if they think you might have something more serious they will advise you what to do or connect you to 999 if you need an ambulance. They will also have details of other relevant health information services. Call 111 for incidents where you feel you probably don’t need to call out the doctor, or go to the accident and emergency department and it’s not really a 999 emergency, but you do need someone qualified and experienced to turn to.